This is a lovely rollicking read-aloud book, in which Marmaduke Duck discovers his jam-making passion and chaos ensues! Prepare for mayhem, tonguetwisters, and one of the best final lines in any picture book ever. The illustrations for Marmaduke Duck were created with gouache, prismacolor pencils, and photoshop. Another rollicking Marmaduke Duck adventure in which Marmaduke meets his match! Marmaduke sets up shop and does a roaring trade selling his much-feted marmalade ... then along comes Bernadette Bear who opens a honey shop next door, and takes all of Marmaduke's business! What will he do? A delightful story about the importance of sharing and caring. 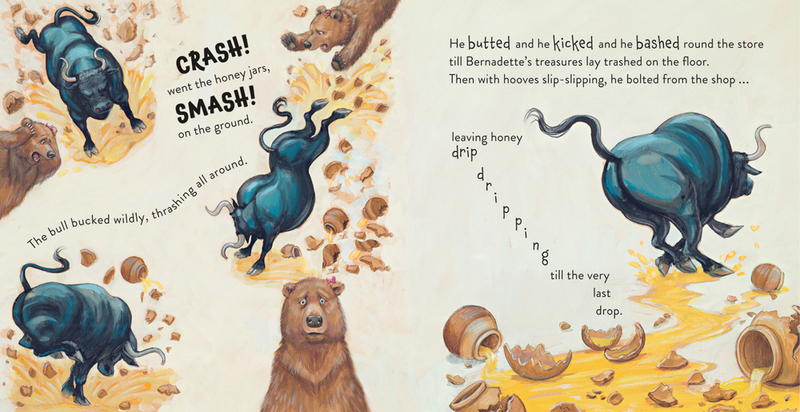 The illustrations for Marmaduke Duck and Bernadette Bear were created with gouache and prismacolor pencil. The fun and fantastic verses by Juliette McIver are always impressive and great to read. While Sarah Davis’s illustrations are just gorgeous. Another rollicking Marmaduke Duck adventure in which Marmaduke sets off to sea! The illustrations for Marmaduke Duck on the Wide Blue Sea were created with gouache and prismacolor pencil.